This postcard, circa 1900, is one of my favorite images. It’s one of the only ones framed and hanging in my home. The gondolier looks like he’s literally about to take flight. The original post for this postcard can be seen here. I shot this photo during Regata Storica in 2005. The boat is a one-of-a-kind vessel known as a “disdotona”. This 18-oar vessel is the pride and joy of the Società Canottieri Francesco Querini - a rowing club in Castello. The boat and the club are discussed in more detail in a post entitled “Holy Remo – Part 2”. 8/24 – Sunset Gondola Banner (ferro to the left)This photo was taken during a visit to Sunset Gondola in October of 2008. To see some of the other photos from that visit, go to the original post. 8/25 – P.O.V. in N.B. 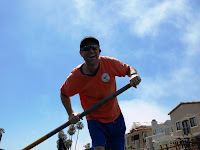 A typical gondolier-point-of-view, taken while rowing in Newport. This one comes from a large photograph from the World’s Fair in Chicago of 1893. I did an extensive post on it back on November 30th of 2008. Shot by my daughter Cassandra in Newport. This began as an attempt to capture the full moon from the quay at Piazza San Marco. I was in a bit of a rush to catch a vaporetto, so I really didn’t know if what I’d shot was worth anything until I downloaded everything. The photo ended up residing at the top of the blog for quite some time afterward.